Indiana Jones Party- Girl Style! 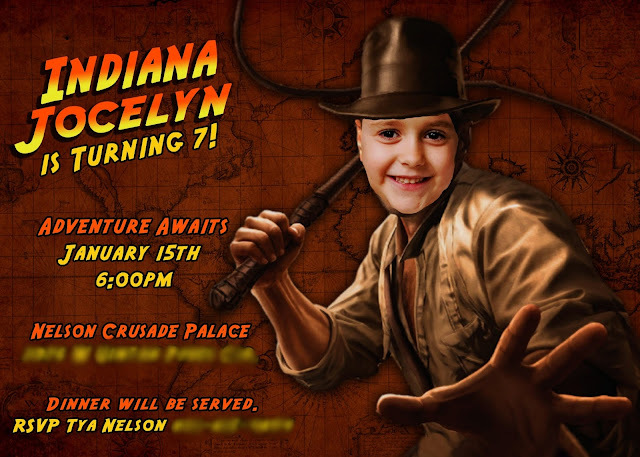 It was definitely a surprise when my daughter decided that for her 7th birthday party she wanted an Indiana Jones themed party. Of all the parties she's chosen, this was the one I think was the most fun, for kids and adults! Definitely one I could get on board with! There are so many ideas and ways to take it! We decided that since the only Indiana Jones she had been exposed to was the ride at Disneyland (the inspiration for the party), that she needed to see the movies as well, so we went to work viewing movies and planning the aspects from each movie that she wanted in the party. She knew that she wanted to have each kid feel like they were Indiana Jones in an adventure, with a diary like his and a hat. So we planned the party around quests highlighting a special feature from each movie. She had a lot of fun picking ideas and we were able to use most, except the one involving everyone driving jeeps through our house and swinging on a vine from our chandelier! We decorated the main floor of our house with an immense number of plants and vines. I pretty much cleaned out every fake plant every neighbor of mine had and filled the house so it resembled so many of the jungles in the movies. It turned out pretty cool, and for a January birthday was quite cozy! We also decked the walls with posters and memorabilia from Indy's travels and movies. These Sankara stones were so fun to make out of poly foam and even glowed with the candles inside. When each of the guests arrived, they were dressed in their hat and whip ( made of braided yarn-much safer with young children than a real whip) and satchel, then their picture was taken to glue inside of their own adventure diary complete with engraved name of "Property of Dr. Jocelyn" or whatever their name was. The kids loved it and it was fun to watch, even though many of them had no idea who Indiana Jones even was. and make it to the bottom before my husband send the ball bouncing down after them. Once they had successfully made it down, they were given the clue to the next quest. The next quest sent them to our basement which we had lit with flame pots and candles for a cool ambient effect, which served as the stations for the next 4 quests. 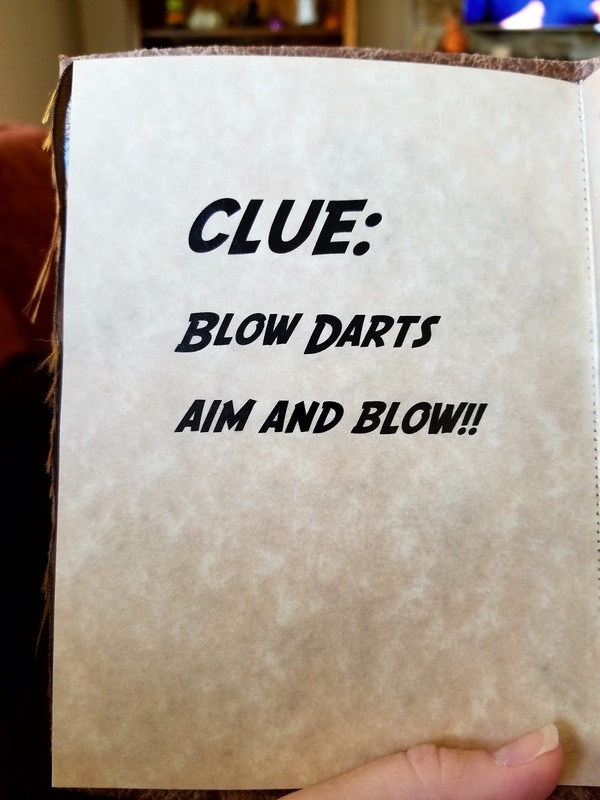 The first one was blow dart practice., to learn how to escape the natives. Each child was given a blow dart gun made of PVC pipe and feathers and a handful of cotton balls. We set up targets on the wall and they each got to practice their aim. Once each Indy had their chance, they were given the second clue in their quest. The room was surrounded with boxes labeled to look like they were at one of Dr. Jones' excavation sites. The kids shot at different boxes and targets before being given their next clue. For target practice, each adventurer was handed an Indy whip, since their yarn whips weren't heavy enough to whip at things, and got to practice using it to knock over stacked Styrofoam cups. This was a fun one to watch, many of them got pretty good at it! The next clue sent them to Pankot Palace, by way of the snake tunnel, since we all know Indiana Jones LOVED snakes! 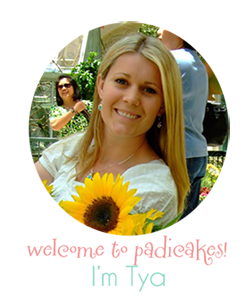 Those who made it through the snake tunnel, arrived safely at Pankot Palace where they were met with a nice serving of delectable treats. Monkey Brains (cold spaghetti) or Eyeball Soup (warm water with peeled grapes floating in them). We turned the lights down and only had Christmas lights for lighting, then covered the tops of the bowls so the kids had to feel through the bowls to find a metal key that unlocked the chest containing the next clue. excitement up the stairs to find him! Since I was young, my dad has always had this weathered leather jacket and hat. It is just a regular coat and hat he'd wear, but we always used to say that it was his Indiana Jones outfit, and since he is also an outdoors man, he also had a holster that looked very close to the ensemble as well. We always loved it when he wore it, even though he didn't see the resemblance, haha. As soon as my daughter picked the party theme, I knew we had to have "the real Indiana Jones" at the party, and being a good grandpa I knew he'd say yes! It was really fun to watch the kids so shy around him whispering that he must be the real Indiana Jones at Jocelyn's party, and how lucky she knew him! Indiana Jones gave them their next clue instructing them to use the Staff of Ra to find the antidote to cure their poisoning and sent them off to find it! The headpiece for the staff was made on a 3-d printer and attached to a broomstick. 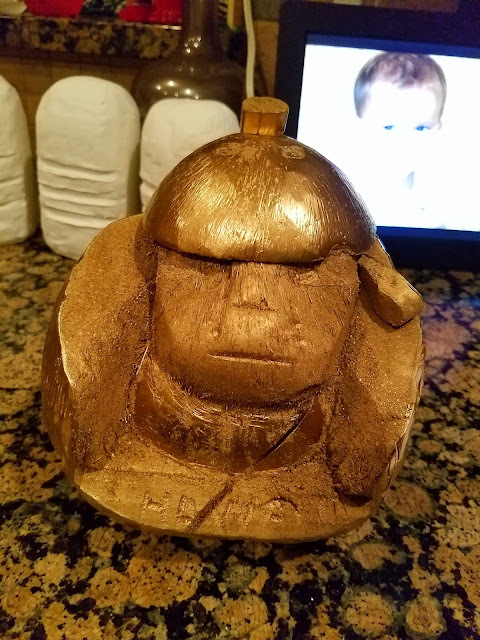 I had my friend help with it and she would have the kids hold it and she would point a flashlight the hole in the headpiece shining it a the stack of crates to reveal the location for the antidote and the final clue. The crates revealed a bag with a bunch of small glass vials with blue antidote (blue Gatorade) and the final clue which instructed them to "choose but choose wisely". They drank their antidote and were cured and sent off to the kitchen to eat after their long quest came to an end! We finished all the adventuring with our Ark piñata! 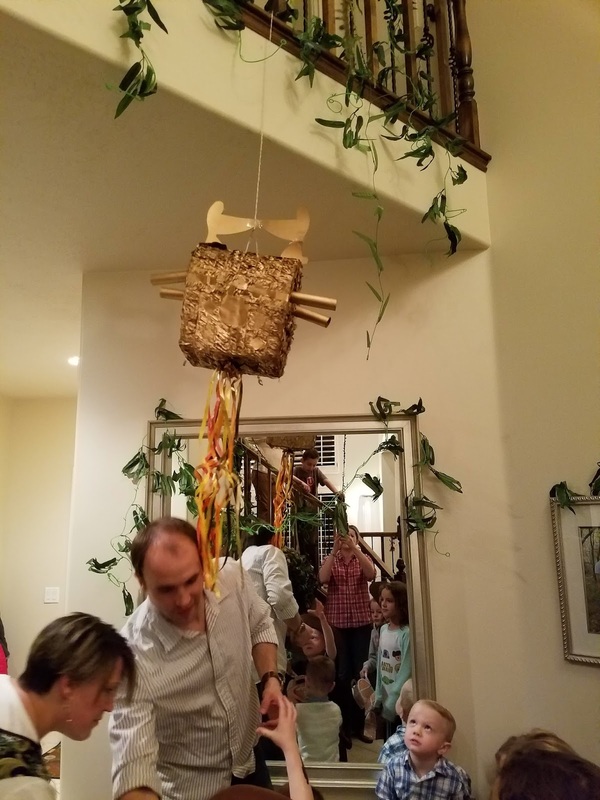 Since no one makes an Ark of the Covenant as a piñata meant to be smashed to smithereens- and possibly be struck by lightning-haha, we made our own out of a pirates chest piñata and added two paper towel tubes to each side and cherubs on top then sprayed it all gold. 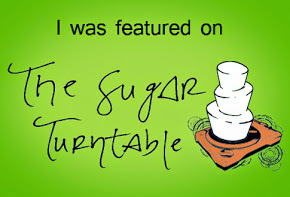 it was a much better than the alternative and fun to watch. For the food at the party, we decided that since the inspiration for the party from my daughter came from the ride at Disneyland, we would theme the food after the Bengal Barbecue. The kabob restaurant we always eat at that sits right across from the ride entrance. This was one of the funnest dessert tables I've done for a party, could be because I love the movies, haha not biased at all! My daughter also had fun helping come up with ideas for themed treats. We tried to have each of the movies represented on the dessert table. and of course, because of the theme, we had to have real bugs to eat and see how brave the parents of our little adventuring guests were. It was great to watch the adults dare each other and their kids to try a real cooked bug as the night went on. Saved the best for last. I never thought I'd see the day when my 7 year old daughter who loves playing dress up and tea party, would tell me that she wanted a Snake for a cake at her birthday party. But since Indiana Jones hates snakes, it seemed like a good thing for the mini Indy's to have to overcome in order to eat their party cake! 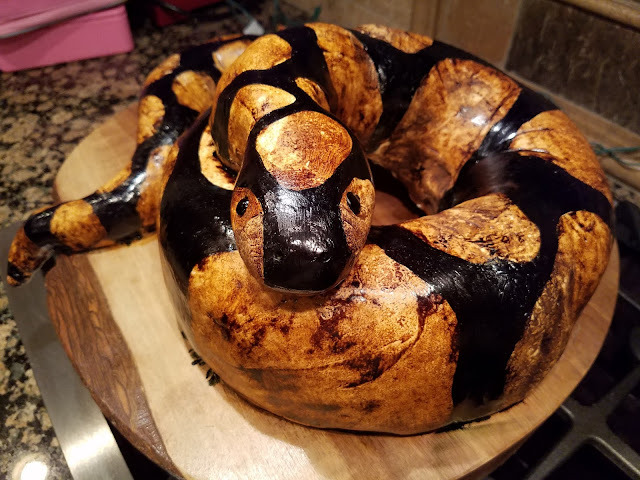 It was my first time making a snake cake, and it was definitely a new feat to try and get it to stay put together, but I loved how it turned out and the birthday girl was in heaven, which is the best part! If you have a little adventurer, I highly recommend an Indiana Jones Party!! 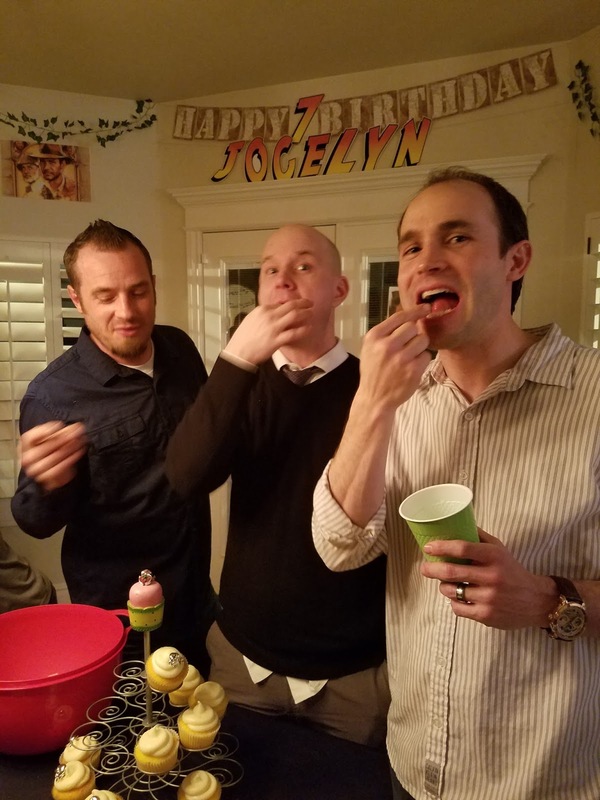 It was a blast to put together and blast to host! I loved receiving text pictures from all the parents of their kids decked out in their whole outfit over the next week everywhere they went!